The time has arrived; the link opened today for the Pantone Quilt Challenge. The 2014 Color of the Year has been really growing on me, especially with all the fantastic prints coming out in this hue. For my entry, I chose to create a Lone Star using Janice's tutorial on her Better Off Thread blog. Rather than create the star from three complete and two partial diamonds, I decided to angle it a bit differently, scotch it over, and have enough pieces remaining from my Kaffe jellyroll to make two quilts. Why? Because this quilt was destined to serve as a swap gift for my secret pal at Quilt Bliss, and, somewhat lacking in selflessness, I wanted one too. I marked quilting lines using my Bohin marking pencil , which is honestly one of my favorite notions. I use it any time I want to mark darker fabrics. I started at the edge of the star and marked lines 1 1/2" out. I continued until the lines met or made it to the outer edge of the quilt. By my calculations, this would suffice to keep the batting from bunching. If I felt the need for additional quilting, I could always mark and quilt down the middle of each completed line to make them 3/4" apart instead. Doing lines further apart first makes pleating and bunching less likely anyway. I used a bright green 40 weight thread and my walking foot. It turned out to be a nice wall-hanging size at 34" square. Thanks for stopping by, and welcome to all new visitors. Hurray for another lone star quilt! Love that purple with the Kaffe fabrics! So beautiful! And glad you made two!! This is just fantastic! The colors are so rich, so vibrant. And what a perfect idea to make 2! This is really stunning! 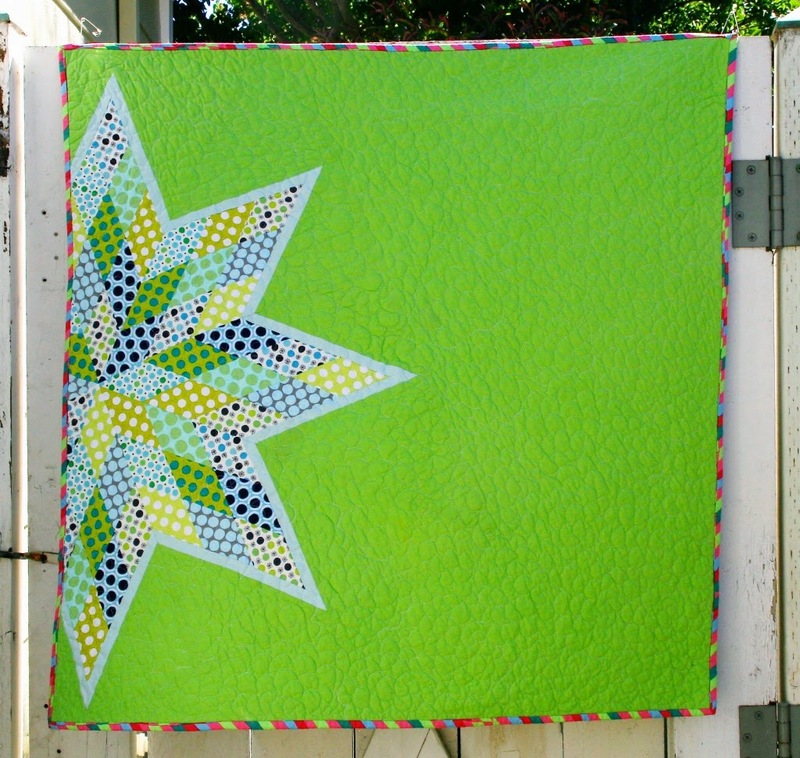 The Kaffe prints look fantastic against the purple background and I love how you used the lime green as the outline for the star and then again for the binding - it's so punchy! Love the purple and green combo. Great quilt! I agree the purple and green is gorgeous! I'm a big fan of echo quilting too. Nice work! Yummy, I love that purple with the lime green! Those kaffe prints you used work so well with the color scheme as well. :) Beautiful! This is really cool! The star reallt stands out with these colours. Hi, I’m the editor at Make Modern magazine and we’d love to feature your quilt in a little gallery we’re doing on this challenge but I can’t find your email address to email you direct – can you email me jane @ makemodern dot com dot au if you’re interested please?